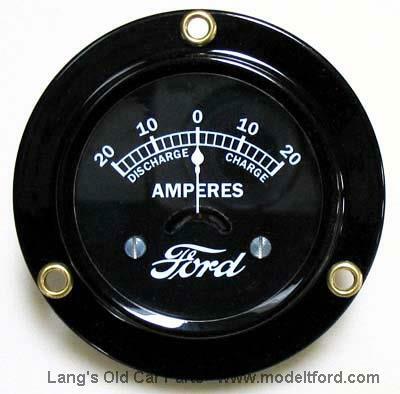 Built exactly to Ford dimensional drawings this very accurate ammeter is a faithful reproduction of the typical “Large Diameter” 1919-1925 Ammeter. It has a Ford Script, 20-0-20 scale dial. It features a "steady as a rock" D'Arsonval meter movement designed for rugged applications. It does NOT bounce when the T hits a "bump" in the road keeping a steady reading. Better than the original specification of 5% accuracy, this ammeter features 1.5% full scale accuracy to allow precise adjustment of the Ford charging system.